Rosemary Sieracki is proof that laughter is the best medicine. 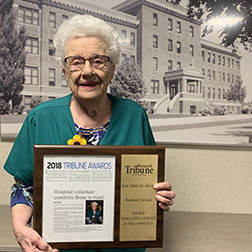 Her sweet smile and bubbly laugh has been helping cheer patients and families at CHI St. Alexius Hospital for almost 50 years. Sieracki, who is in her 90s, is a volunteer for the CHI St. Alexius Hospital Auxiliary. It was through auxiliary that Jennie Bachmeier met Sieracki. "When you sit at the hospital and see people come in and know they're hurting about something ... friendliness helps an awful lot," Bachmeier said. Bachmeier recalls an instance of a woman, in a somber mood, browsing through the gift shop. The woman told them her granddaughter had been born early and was in the NICU. As the woman left she told them: "This really helped." It was a relief for her to talk to somebody. In addition to delivering mail and working in the gift shop at the hospital, Sieracki is also a fixture in the kidney dialysis unit, where she gives hugs and holds hands during patients' treatments. "She just has this caring personality," said Lonnie Decker, who knows Sieracki from church and Bible study at Cathedral of the Holy Spirit. "She gives and gives and gives." Each year, the Tribune honors members of our community who have gone beyond what's expected of citizens. These individuals or groups have done good works, shown kindness, level-headed action and, in general, given more than they received. Nominations for the Tribune Awards came from editors, reporters and the newspaper's readers. We want to make a special note of the Bismarck Air Medical crew killed in a November plane crash. Pilot Todd Lasky, nurse Bonnie Cook and paramedic Chris Iverson were nominated for the award.